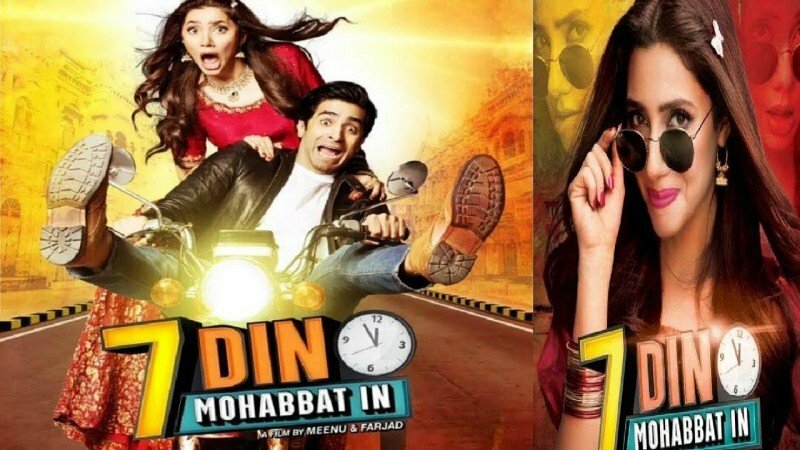 ‘7 Din Mohabbat in’ is another venture by Mateela Films, directed by the directorial duo of Farjad Nabi and Meenu Gaur, and written by the ‘heavy-weight’ TV writer Faseeh Bari. It stars our home grown cross-border super star Mahira Khan. Mahira’s appearance was a guarantee for success. Of course the temporary ban on Indian films came as a profitable ‘Edi’. The film starts out with a (somewhat confusing) dream sequence. The dreamer is the protagonist Tipu (Played by Sheharyar Munawar). The female lead Neeli (Mahira Khan) is a naïve happy go lucky girl. Then there is our own answer to Om Puri (but a good looking one), Javed Shaikh, playing a ‘con-genial’ genie, called Dawarka Parsad. The gist of the story is that Tipu, a geek in the literal sense of the word, wants to be successful and finds a genie who strikes a Faustian bargain with him (find a girl with a ’til’ who says I love You” in seven days.) One is reminded of the Beauty and the Beast where the evil fairy places a similar spell on the prince-turned-beast. Our story, however, is slightly different from Beauty and the Beast. The film starts of as a ‘comedy’ and then suddenly turns into a fantasy adventure, followed by a romantic tragedy and ending like Martial Arts movie where the Geek-turned-Romeo/Jacky Chen beats the hell out of tall muscular Amir Qureshi. The world over, comedy has a variety of genres. There is satire, absurd comedy, black comedy, scatological humour, sexual humour, race humour not to mention the comedy of manners. Look at Jim Carey’s ‘Bruce Almighty’, Bradley Cooper’s ‘The Hangover’ or even Sanju Baba’s ‘Munna Bhai’; three of the finest examples of different types of comedy. Drawing laughter from funny people falling over banana peels gets boring after a while. In ‘Mohabbat In’, as soon as the viewer gets comfortable with the ‘comedy’ genre, lo and behold, within the first ten minutes, the film turns into a fantasy adventure where Dawarka, the Jinn, is coming in and out of the talismanic bottle, has humans enslaved, displaying powers to turn the zero geek into a super hero. Even in fantasy films, the work has to have some angle that can be believed. ‘Lord of the Rings’ has wizards and flying beasts, but the filmmakers go to great lengths to make them believable. ‘Krish’ had aliens and super humans, but the universe of the film was well thought out, seducing the viewer into believing the unbelievable. That’s what great films do, make you go into a trance, into a different world, and you only come out when the credits start. Sadly this was not such a film. From scenes taken straight out of ‘Spiderman’ (The protagonist no longer needing glasses) to a ‘bomb’ which makes a male into a female, to a transgender suddenly coming in (perhaps to make it a ‘message based’ film), the film has no linear narrative. It mixes up genres and the story-line is incoherent. The acting in most cases is tacky. Amna Illyas as Ghazala is expressionless, unsuccessfully playing a caricature of a man-hating feminist. Amir Qureshi is however impressive as the antagonist, and with his blend of good looks and character acting, he is sure to rise further as a film actor. The film pounds you with ‘background music’, like a novice who has discovered the power of the sound track. The score, which imposes itself on you, unsuccessfully tries to cover the bad dialogues, long drawn scenes and wayward direction. A word of comfort: the film, at least it looked like one. The shots were not reminiscent of a TV soap. The Song ‘Yonhi rastay main’ is the highlight of the film, with its catchy tune and engaging imagery. The film ended with members of the audience laughing but for wrong reasons. The film may make profit at the box office considering its star power, Dawn Films’ media power and lack of worthy competition. May be the ‘Mohabbat In’ team should send a thank you letter to their Bollywood colleagues.